AC load banks are primarily used by electrical contractors, service companies and genset manufacturers for the purpose of testing and commissioning. Power Systems Plus design and manufacture several common and custom AC Load Banks, ranging from 5 KW to 1500 KW at single and 3-phase 208/240/480/600 volt AC. Both Stationary and Portable load banks are manufactured at Power Systems Plus. This particular model is used by company’s testing many different sizes of generators in the shop and field. It is a portable lightweight unit weighing approximately 230 lbs, and is easily handled as it is on 5” casters and has skid type handles for maneuvering. It is fabricated from aluminum to provide a lightweight and corrosion free product. Load Bank Wireless Remote Control – As part of Power Systems Plus ongoing innovation and expertise along with a strong commitment to exceed customer expectations, we have recently made the 250 KW Load Bank even more practical and useable with the incorporation of a wireless remote control on selected models. Please contact us to find out more information on the details and availability of this product. The design and manufacturing of this unit is similar to our 250KW Multi-Volt, however the capacities are higher and the enclosure is larger. This portable unit is on 8” casters and also has the skid type handles. It weighs approximately 375lbs and requires two people for effective use and maneuvering. This is a new product that we will be introducing to our rental fleet and sales department. It weighs approximately 180lbs and also has skid type handles for easy maneuvering. This compact and light load bank is easily handled by one person and is also capable of 4 different voltages. 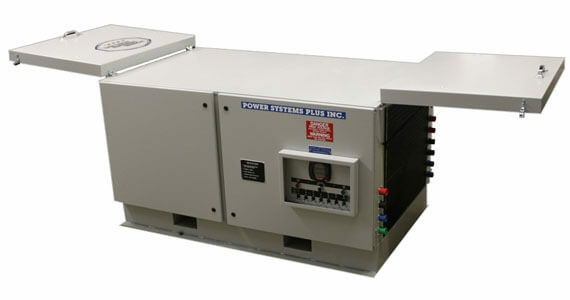 Stationary Load Banks are also designed, manufactured, and installed at Power Systems Plus Inc. These units are designed for pad mount, roof mount, or wall mount and are used for minimum load requirements for prime or stand-by generator sets. This is only a partial list of load banks. As noted, several of our products have been standardized, however, the majority of the load banks are customized to meet user’s specific needs and specifications. For more information on sales and rentals and to discuss your load requirements please contact us.